Random.org chose #11. The winner is Queen Size Funny Bone! After Thanksgiving, the kitchen was a mess! 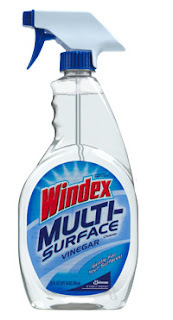 So I pulled out the Windex Multi-Surface with Vinegar that I received recently, and tackled the mess. Windex Multi-Surface is gentle and safe on all of your surfaces such as marble, granite, formica, ceramic, stainless steel, glass, and more. And the vinegar makes a tough cleaner. It also has a pleasant smell. It worked so well on the whole kitchen, and using only one cleaner saved time! I bet you could use a good cleaner before your Christmas guests arrive. And I have one to give away to one of you. All you have to do is leave a comment on this post before December 11, 2010, 11:59 CST. **Leave a comment on a non-giveaway post, come back here and tell me about it. **Tweet this post. Leave a comment here with your link/user name. **Follow this blog on Google Friend Connect. ** Join a discussion in my Blog Frog Community. Random.org will help me choose the winner. Good luck! This post was part of a campaign with SC Johnson, makers of Windex, who provided the product for review and giveaway. All opinions are 100% mine. I like multi task cleaners so I don't have to keep so many bottles under the sink. What I great Idea! I already use my windex for all surfaces. I'd like to try that! I use GreenWorks right now. It works pretty well, but it doesn't really seem to get down to the nitty gritty when I need it to.